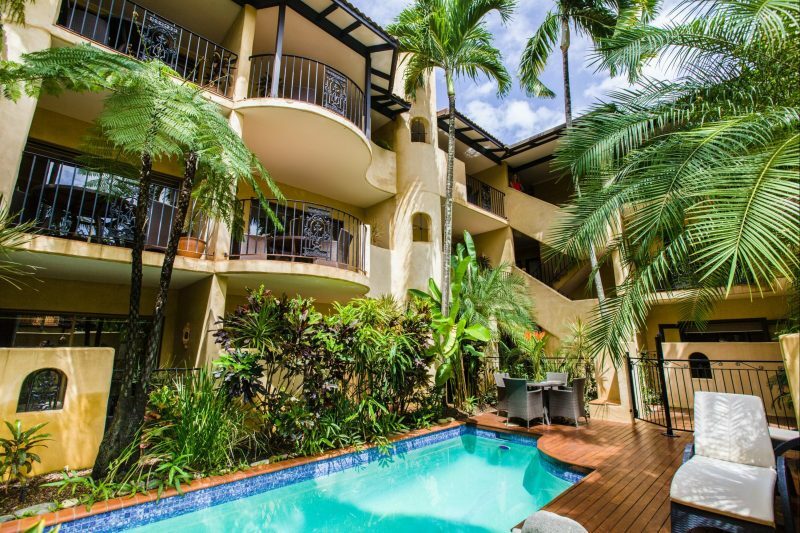 Villa San Michele boasts a fantastic location on vibrant Macrossan Street in the heart of Port Douglas. 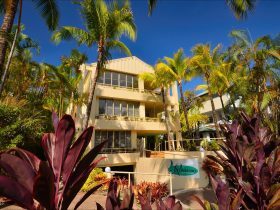 The central location places all that Port Douglas has to offer on your doorstep, and all within a five minute walk. 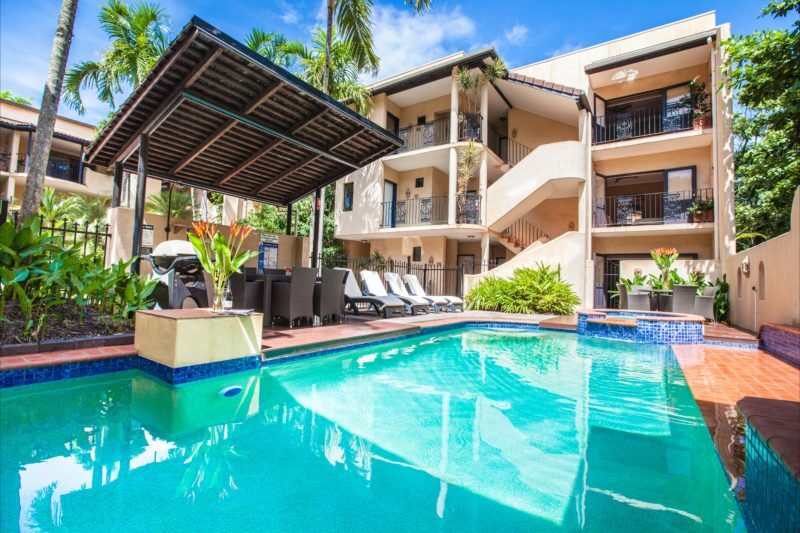 The unique Mediterranean style refurbished apartments feature complimentary wi-fi and are situated around a courtyard of tropical gardens with two heated saltwater swimming pools, spa and poolside barbecue. The private location set back from Macrossan Street provides guests with a secretive and peaceful retreat. With complimentary undercover parking, Villa San Michele also caters for those wishing to self-drive. A complimentary guest laundry is also provided. 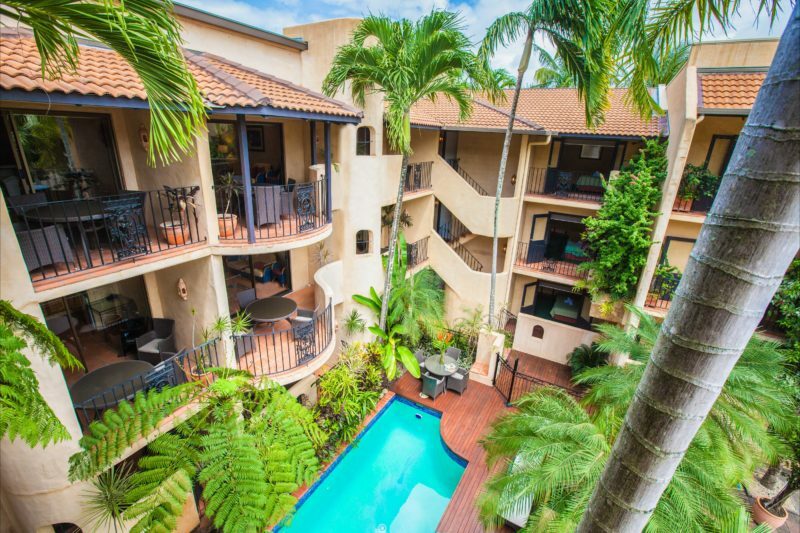 The one and two bedroom self-contained apartments open onto a private balcony. 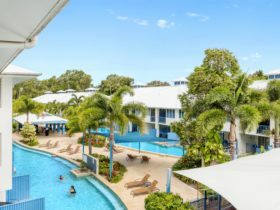 The fully air-conditioned apartments are generous in size and offer a choice of queen or twin bedrooms with refurbished ensuite bathroom and adjoining lounge. The two bedroom apartments boast two refurbished bathrooms and two private balconies. 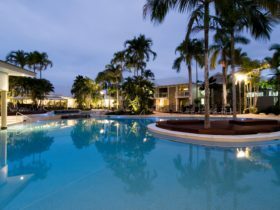 The village of Port Douglas offers visitors the perfect place to unwind. Relax on stunning Four Mile Beach, browse the boutique shops or enjoy a meal at one of the many award winning restaurants. 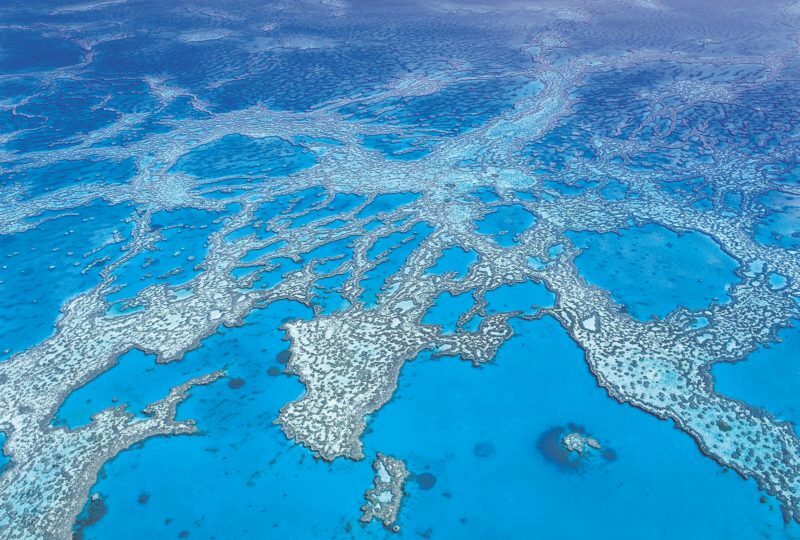 With over 100 tours on offer there is something to suit everyone. Villa San Michele’s Two Bedroom/Two Bathroom Apartments (85 square metres) feature two private balconies, one being a large balcony with outdoor dining overlooking the gardens and the other a smaller balcony which overlooks the pool/courtyard area. The Two Bedroom Apartments include free wi-fi internet and sleep up to five people. The main bedroom has a queen size bed with access to the large balcony. The second bedroom has a choice of either a king or twin single beds and small private balcony. 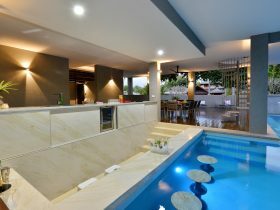 These Apartments are perfect for a family or two couples travelling together that still wish to have their own privacy. The apartments feature refurbished bathrooms and kitchen. 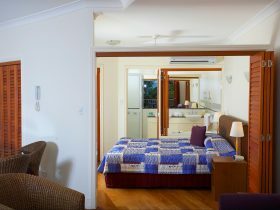 Apartments are fully air-conditioned and feature two LCD televisions, two DVD players, satellite television, fans, digital safe, telephone, hairdryer, iron/ironing board. Villa San Michele’s unique Mediterranean style One Bedroom Apartments are spacious (50 square metres) and sleep up to three people. They include free wi-fi internet access. The bedroom has either a queen or two single beds and the refurbished ensuite bathroom comes with walk-in shower. The refurbished kitchen includes a dishwasher, convection microwave, fou burner cook-top and fridge. Terracotta flooring and local artwork add to their unique Mediterranean ambience. 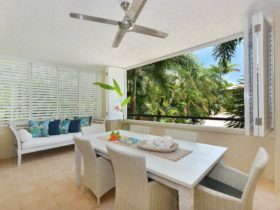 All apartments are fully air-conditioned and have a private balcony with either pool, street or garden views. Other facilities include flat screen LCD television, DVD player, satellite television, ceiling fans, digital safe, telephone, hairdryer, iron and ironing board.